﻿ How to add value to MSA optical transceivers? Optical fiber is the transport medium that has emerged to accommodate the expected long-term growth in the communications industry. Taking advantage of the wide bandwidth — the principal advantage in optical communications systems — requires stringent control and monitoring of various optical fiber related parameters such as temperature, average laser power, and extinction ratio. The evolution of today's optical transceivers and transponders is driven by multi-source agreements (MSA), which establish a standard for optical and electrical characteristics, module form factor, and pin functions of optical transmitters and receivers. In more recent years the emerging MSAs have stipulated that optical system designers incorporate various diagnostic functionality into transceivers, as well as the traditional monitoring and control functions. These requirements are in addition to an overall drive to continue to minimize size and cost of the optical transceiver design. Engineers whose core competence and background is in optical fiber systems now struggle to understand how to best implement analog and digital control loops, and provide diagnostic information via a 2-wire I2C-based communications bus. Furthermore, they must ensure that their designs continue to adhere to the fast moving and evolving optical transceiver specifications. The ongoing development and evolution of optical MSA specifications such as XFP, XENPAK, XPAK and SFF-8472 present today's optical system designers with a unique set of challenges which must be addressed in an increasingly competitive market segment. The design, test, and manufacture of optical transceivers can be greatly simplified by a single chip, reprogrammable data acquisition solution that can provide control, monitoring, and diagnostic functions in MSA optical transceivers. To date the primary challenge for designers has been maintaining constant optical power (Pav) and constant extinction ratio (Er) with changes in temperature — these parameters are a measure of signal integrity and transmission distance. In addition, designers must include digital diagnostic monitoring to comply with MSA specifications. A re-programmable, single-chip precision data acquisition system with microcontroller in a small footprint can simplify this design challenge. Addressing both the optical monitoring and control design task, this approach allows designers the flexibility to easily incorporate additional features, thus adding value to their optical transceiver or transponder module. Let's examine a typical optical module. On the receive side, data is fed directly from the trans-impedance amplifier (TIA) to an external ASIC or serializer/deserializer (SerDes). On the transmit side, data is fed to a high-speed laser diode driver (LDD), which drives the laser (e.g. a DFB laser at 1310 nm) and modulates the data-signal onto it. A single-chip, such as Analog Device's MicroConverter, can take care of Pav and Er control, and also feed digital diagnostic information back to the host. 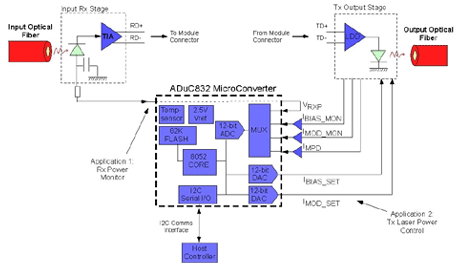 In this case, the ADCs, 8052 controller and DACs are integrated on a single mixed-signal device, the ADuC832. The ADCs and DACs are used to control Pav and Er. This approach takes full advantage of the analog peripherals, while offering users the flexibility to implement either conventional closed-loop control via a proprietary algorithm or feed-forward control via a look-up table. In addition the MicroConverter enables users to feed diagnostic information back to the host via its I2C interface as defined by MSA requirements. This can easily be achieved by using four 12-bit ADC channels to measure Vrxp, Ibias, Imod and Vdd, and a sensor to measure temperature. Results can be scaled or offset (vendor-specific) by the 8052 microcontroller before being transmitted to the host system via the I2C serial port. Furthermore, users can compare these values to preset alarm and warning threshold levels to detect fault-conditions. Users have the option of monitoring additional parameters using the remaining four ADC channels. For more sophisticated transceivers the pulse-width modulated (PWM) outputs may be used to provide extra control channels, e.g. avalanche photodiode (APD) bias control or thermo-electric cooler (TEC) set-point control.